It is funny how random things pop into my mind sometimes. As I was getting ready this morning, and running through my mental to do list, I suddenly thought, Intend to be kind. I am not sure where this thought came from, but I welcomed it. I like to think that I am a kind person, but this random thought reminded me that there is always room for improvement. Always. It also reminded me that good intentions without actions are not so good afterall. 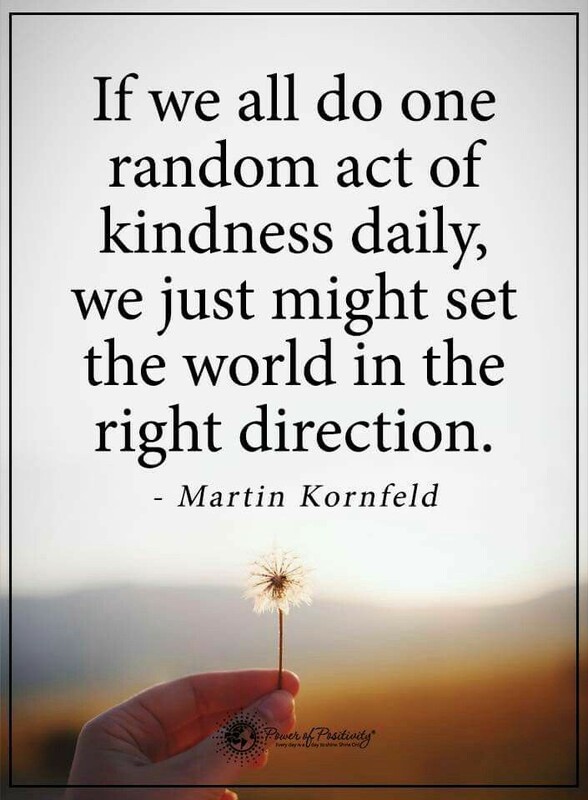 Someone else’s kindness provided me with the opportunity to take action and set off a domino effect of sorts. On the way to my hair appointment, I stopped for a cup of my favorite hot green tea to warm me up on a cold morning. As I waited in the drive through line, lost in thought and music, I felt slightly irritated that the line was not moving faster. My irritation was replaced with gratitude as soon as I reached the head of the line, though. The barista handed me my cup of tea and informed me that the guy in front of me paid for my drink. Original? No. Appreciated? Yes! While I have been the recipient of a random act of kindness such as this a number of times, I never tire of it or take it for granted. It also never fails to inspire me to do something nice for someone else. That small gesture warmed me up more than the tea and left me with a big smile. Immediately, I paid for the next person’s order and set out to find other ways to be kind. Refraining from complaining and speaking positively. Tipping extra. Picking up a treat for my daughter. Giving sincere compliments. Saying thank you. The opportunities to be kind have been aplenty, once I became aware of them. That one random act of kindness did not change the world, but it certainly brightened up my world today. As great as I felt being the recipient of a free cup of tea, it felt even better to be the one who was doing something kind for someone else. Cheers to the nice person who helped me turn my intention to be kind into words and actions of kindness!